 VERY IMPORTANT: Using Kaltura Capture Desktop Recorder requires a machine with a minimum of 4 GB of RAM. To begin this process you will need to be in your Kaltura My Media module. If this module is not showing for you on your Blackboard home page, click Add Module above the menu on the left. Scroll down to My Kaltura Media and click Add. 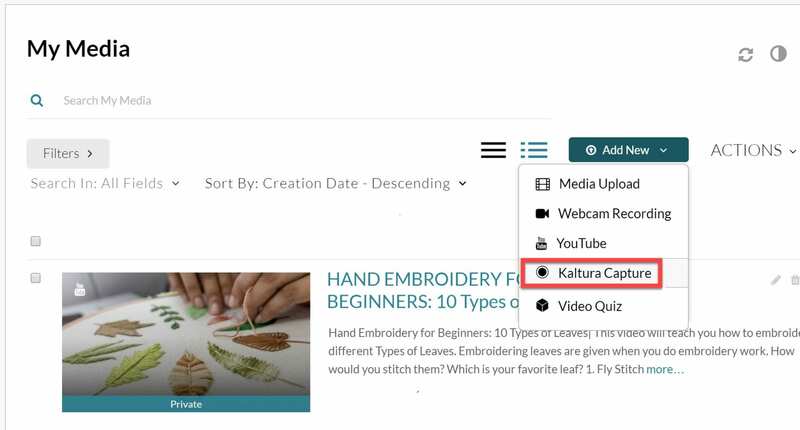 Once you are in your My Media click on the Add New menu in the top right and choose Kaltura Capture. Download the installation file for Windows or Mac. Run the installation file to install CaptureSpace. Go back to the Add New menu in your My Media and select Kaltura Capture again. The website will automatically identify that you already installed the application and will launch the application within seconds.